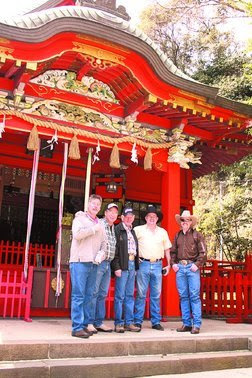 The Bar D Wranglers, from left, Joel Racheff, Levi Mullen, Cy Scarborough, Gary Cook and Matt Palmer at a temple in Kamakura, Japan, after their performance at a cherry blossom festival near Tokyo in April. You can take the cowboy out of the country, but you can’t take the cowboy out of the Bar D Wranglers. The Wranglers traveled to Japan in April at the invitation of Lynn Duncan Cooper, wife of U.S. Navy Captain Justin Cooper, commanding officer of Atsugi Naval Air Facility, which is located 20 miles outside Tokyo. And who says high school reunions aren’t a good idea? Lynn Cooper went to high school in Farmington with Wrangler Joel Racheff. While visiting her ailing father in Aztec last summer, Cooper took her children to see the Bar D Wranglers perform their 40-year-old chuckwagon show. The classmates reunited, and after several months of naval logistical planning and a 13-hour flight to Tokyo, the Wranglers took the stage in front of an audience of 35,000 at a cherry blossom festival. The band not only played the main festival, but it performed intimate living room concerts for pilots and their families from the USS Kitty Hawk. Booked by the Morale, Welfare and Recreation Department from Atsugi, a bunch of cowboys in Japan seemed to be just the taste of home the naval officers and crew needed. And being guests of the commander and his wife allotted the Wranglers special treatment. They played golf, practiced their flying skills in an F-18 simulator (they all crashed), toured an air and equipment show, and were given a tour guide to take them to Mount Fuji and Kamakura, where they visited the great Buddha statue, temples and shrines. The great Buddha is the second largest in Japan and was cast in 1252. “On the inside, you could see the seams where they put the bronze together, but from the outside it is all smooth. It’s amazing how they built it without welding,” Racheff said. 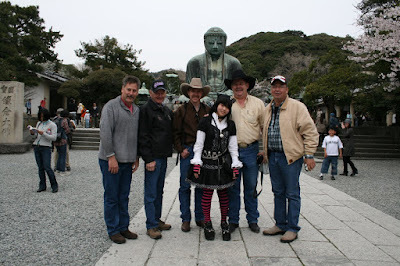 It seems the Japanese citizens also enjoyed having some real western cowboys around. “Everywhere we went, people would stop and take our picture. We dressed like we always do, in our jeans and boots and hats,” Cook said. They were as shockingly noticeable as the Japanese girls dressed up like anime characters. “The Japanese were quiet, humble and unobtrusive people. They smiled a lot. They wanted to help. They were very generous,” Racheff added. The Wranglers were adventurous in their meals, trying everything from steamed octopus and octopus dumplings to sushi and sashimi. Though they admit they didn’t try sushi until they were at the airport waiting for their flight home. Perhaps because it is a recognizable food, but Racheff went on about the Fuji apples. The Wranglers marveled at the immaculate cleanliness of the cities they visited and the accuracy of the trains, the miniature size of the cars and how everything moved like clockwork. “There is no trash. Everything is recycled,” Cook said. The Bar D Wranglers have a worldwide reputation. People in the audience at the cherry blossom festival told the band they had been to Durango and the Chuckwagon. In fact, on Memorial Day weekend, a family visiting Durango brought greetings to the Wranglers from Japan. “How great is it that we got to get on an airplane and go halfway around the world to sing cowboy songs?” Cook said.